It was on 26/03/2017 that I shared a photo circulating in facebook with a content that put me to think about what I observe on daily bases through social mass media. I did a short time contemplation and came with something that I think is worth to be attained. It is good therefore to share what I was thinking while I shared this to my facebook friends. Eritrea is under a tyranny since independence – 1991, since the time EPLF controlled government power. I believe freedom fighters had little knowledge in governance but had huge power to control the country intact. This led them into ab absolute tyranny. Within a short time, people started to suffer. And since 2001 thousands are fleeing from the country to get freedom and live without threats. As a result Eritrea till now under a tyranny – 1991 -2017 – 26 years too much. So much suffering and so much poverty. This is where we are now. So much chaos, so much freedom. There is no law. It is like living in a jungle. But there is high possibility of growing something good out of this chaos. With this so much chaos, wisdom can immerge. 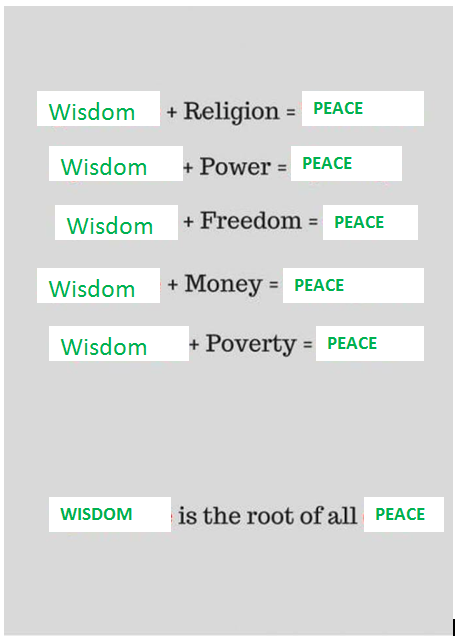 And wisdom compiled with freedom can bring peace. But there is always something coming from chaos. Who knows wisdom can be born. Therefore I hope our ignorance to be gone for good and converted into wisdom in order to get the peace we want to live freely. The secret is how to get wisdom? If you want to shares your views on how to get wisdom, please your comments below in the comment section. If you did this, remember you are educating someone. And it will be the beginning of fighting against ignorance. Just leave some notes.